There is so much that we don’t know yet about our planet, Earth. 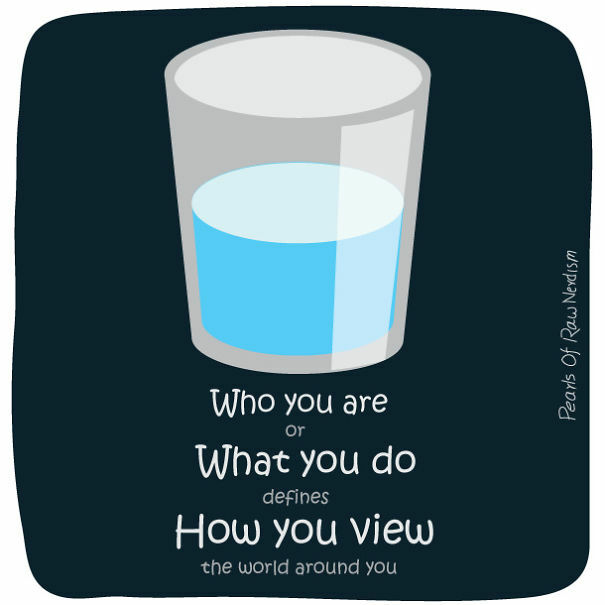 This is especially true when it comes to places which are remote, hard to reach and where the climate is harsh and uninviting. That makes Antarctica one of the most mysterious places on Earth – it’s an icy, remote, desolate desert with many secrets that are yet to be unraveled. The continent is so large that it may seem that scientists are just beginning to explore its vast territories and hidden treasures. 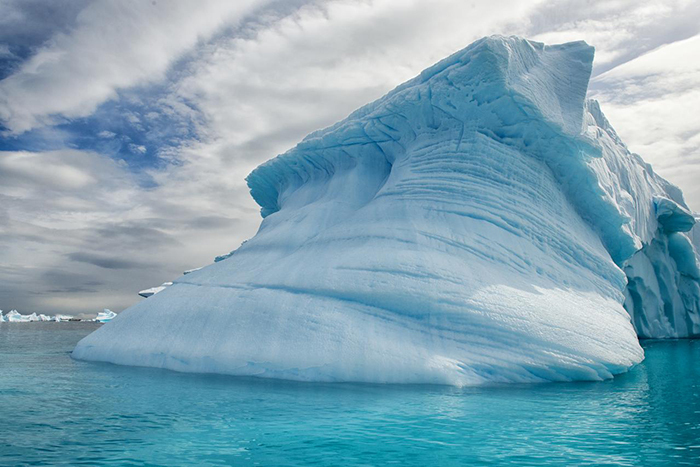 One internet user has compiled a list of the most interesting facts about Antarctica. Scroll down below to read the full list of amazing, fascinating and even unsettling data that is known today about the world’s harshest desert. 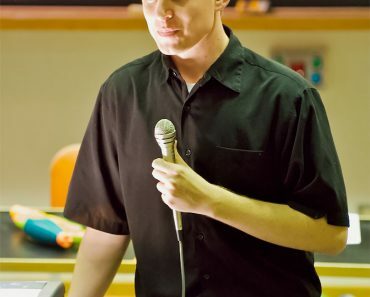 One cold and lonely December night, an American scientist, who was conducting research on Antarctica, decided to log on to Tinder just for fun. He wanted to see if there were any women out on the icy, lonely continent. At first, no profiles showed up, but after the scientist expanded the app’s location radius, he actually found someone: another researcher, just a 45-minute helicopter ride away. He swiped right and a few minutes later they matched, making it the first Tinder match on Antarctica. In 1978 Emilio Marcos Palma made history by being the first person to be born on Antarctica. His father was the head of the Argentine Army detachment at the Esperanza Research Base. Since then, ten more people have been born on the continent, but Palma’s birthplace still remains the southernmost and has featured in the Guinness Book of Records. 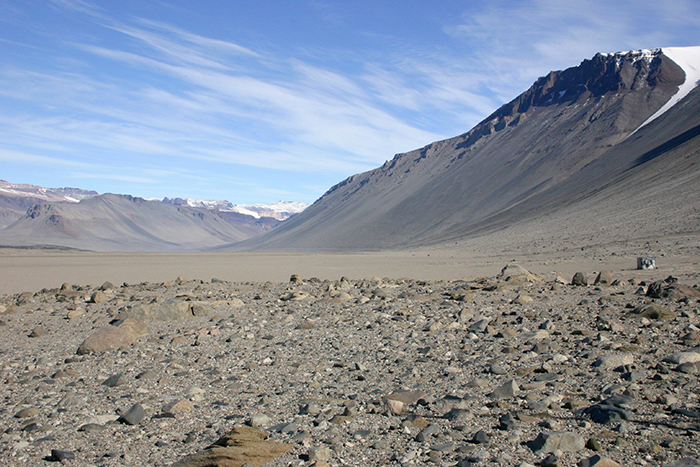 In Antarctica around 1% of the continent (4,000 km or 2,500 mi) is permanently ice-free – such areas are called dry valleys or Antarctic oasis. They are thought to be the world’s harshest deserts and it is estimated that these areas haven’t seen rain or snow in almost 2 million years. According to one study led by Australian scientists, due to climate change ice-free areas in Antarctica could expand up to 25% by the end of 21st century. This could drastically change the biodiversity of the continent. 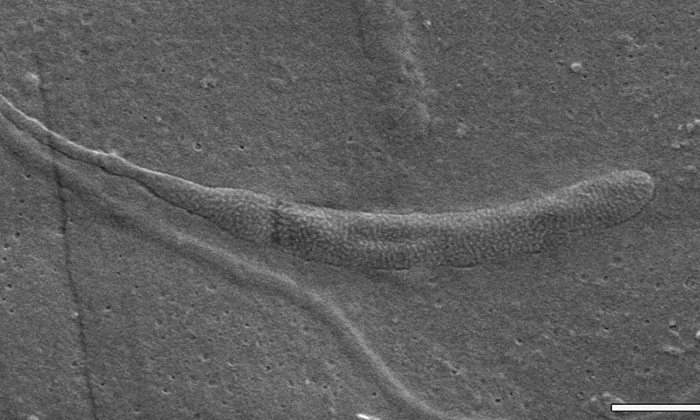 Back in 2015, scientists from Sweden found a 50 million-year-old fossilized clitellate worm cocoon in Antarctica, which contained the world’s oldest sperm. The sperm of this worm is very short-lived and extremely hard to find, however because it became trapped in the jelly-like cocoon before it hardened, it was preserved for millions of years. Don’t worry – no real blood is running there. 5 million years ago, as sea levels rose, East Antarctica was flooded and a brine lake was formed there. After millions of years, glaciers formed on top of the lake. As they froze, the water below became even saltier. 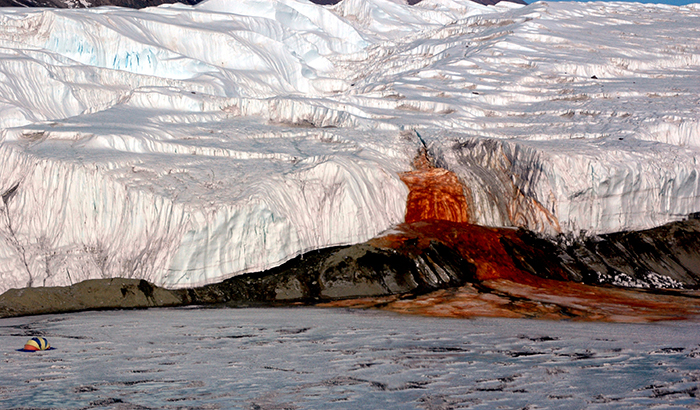 Today, the subglacial lake under Blood Falls is three times saltier than seawater and, therefore, is too salty to freeze. The water beneath Taylor Glacier, which feeds the Blood Fall, contains a lot of iron (picked up from the underlying bedrock) and when iron-rich water comes in contact with air, the iron oxidizes and takes on a red coloring, leaving blood-like stains on the ice. According to scientists, meteorites land everywhere with almost equal probability. However, if they fell in a humid jungle climate, moisture and oxygen would corrode them. In Antarctica, where the climate is extremely dry, the likelihood of corrosion is almost non-existent. In addition to this, naturally, the rocks are easier to spot on the white, icy surface of Antarctica. 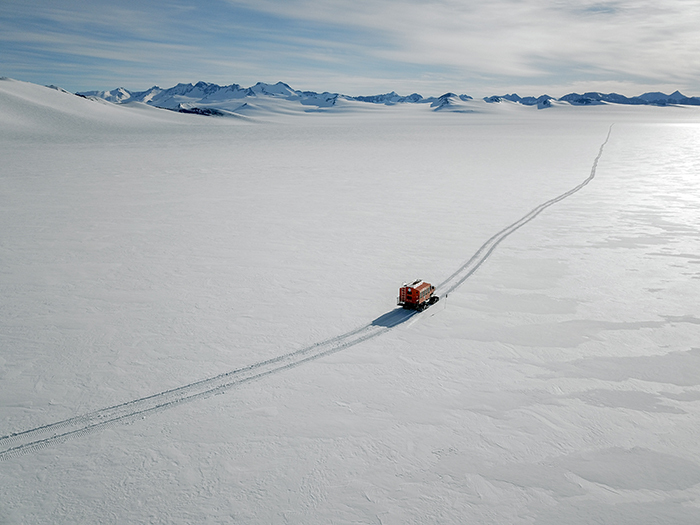 Lastly, sometimes the East Antarctic ice sheet’s path to the sea is clogged by mountains or other obstructions. 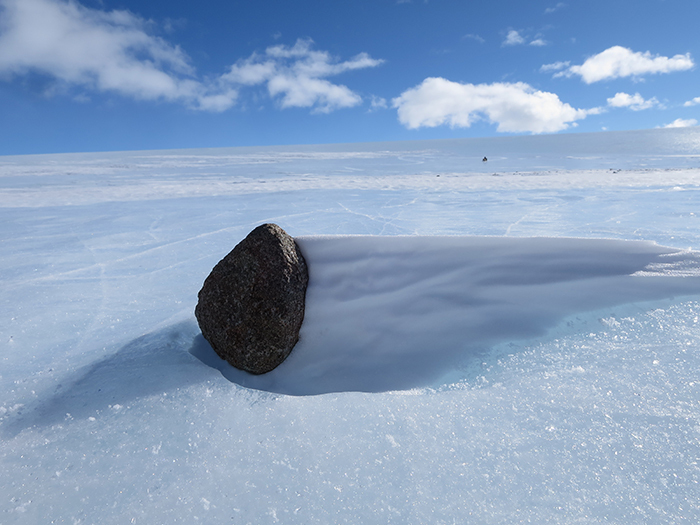 If the sheet stays in one spot for a long time, strong winds and sunlight can evaporate the top layers and reveal much older ice and large meteorite concentrations within it. This way, more than 20,000 samples of rock from unknown sources were collected since 1976. 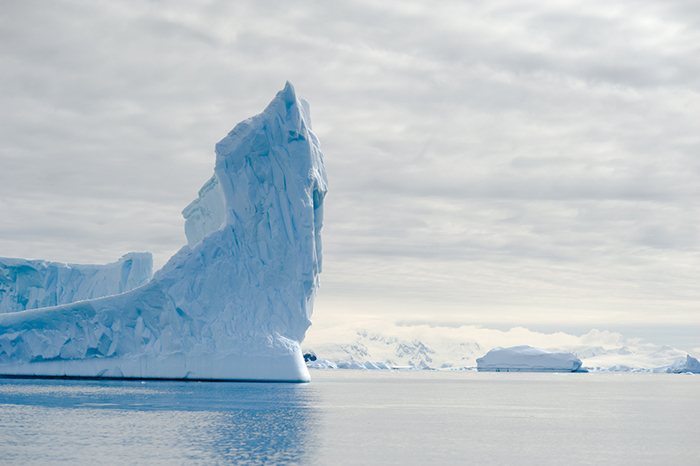 Around 90% of the world’s ice and 70% of the fresh water is in Antarctica. 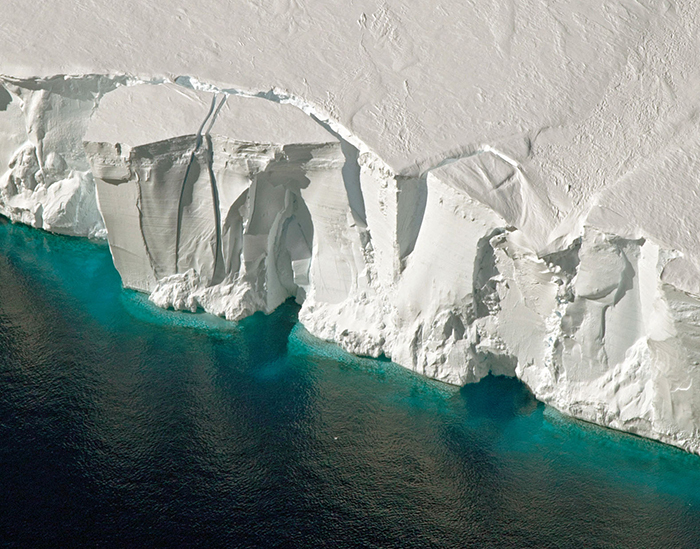 If all of the Antarctic ice melted, sea levels in the world would rise about 200 feet (61 meters). Antarctica, the southernmost continent, is almost completely covered in a thick layer of ice (except for dry valleys, which make up around 1% of the area). 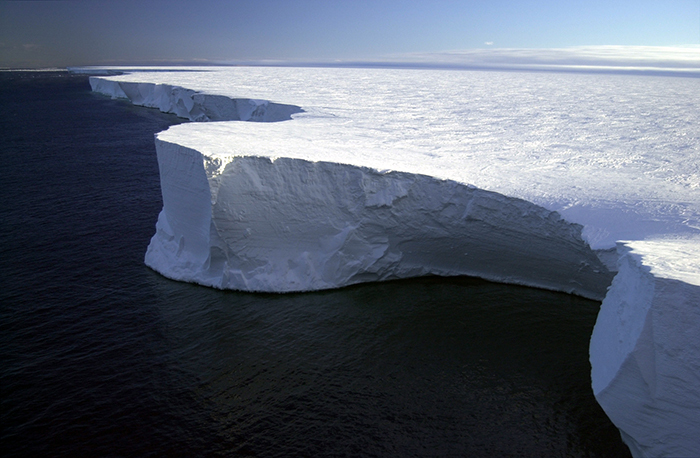 The thickness of the ice sheet varies depending on the location, with the East Antarctic sheet being much thicker than the one in the West. On average, the ice is more than one mile (1.6 km) thick, but in some sections it can get as thick as almost three miles (4.8 km). The world’s largest recorded iceberg, was Iceberg B-15, which measured around 183 miles (295 km) long and 23 miles (37 km) wide, with a surface area of 4,200 square miles (11,000 sq km) – making it larger than the whole island of Jamaica. In 2000, the Iceberg B-15 broke up into smaller icebergs and later drifted away into the sea. 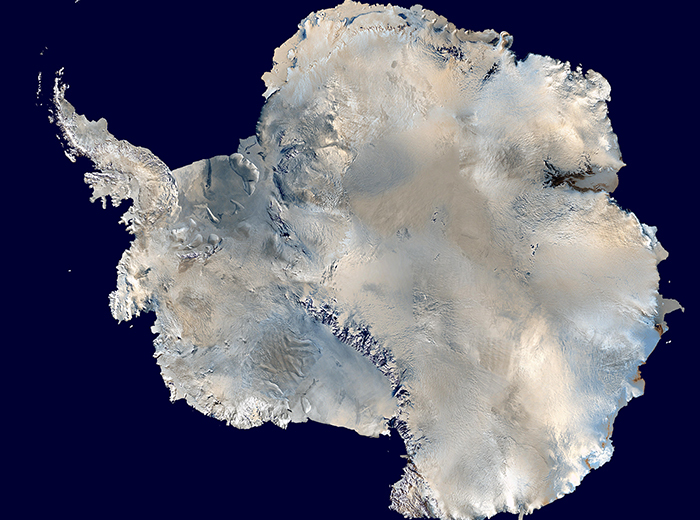 The highest temperature ever recorded on the Antarctic continent, was 63.5 °F (17.5 °C). The discovery was made in 2015 at the Argentine Research Base Esperanza, near the northern tip of the Antarctic Peninsula. An even higher temperature of 67.6 °F (19.8 °C) was recorded on Signy island, located on the South Orkney Islands of Antarctica, back in 1982. It is hard to believe, but once Antarctica was a green, tropical paradise with furry mammals like possums and beavers. Scientists say that it is only in the quite recent geological past it got so cold there. Around 52 million years ago, the concentration of carbon dioxide (CO2 or the greenhouse gas) was more than twice as high compared to today and the climate was much hotter. 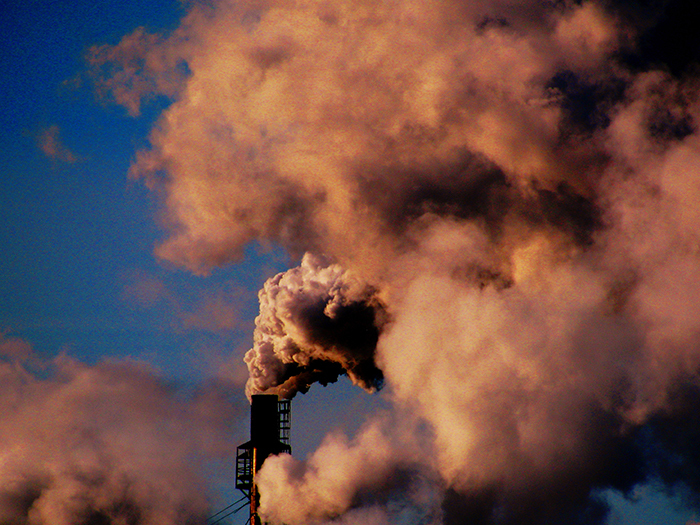 However, according to scientists, if the current CO2 emissions continue to rise due to burning of fossil fuels, the amount of greenhouse gas in the atmosphere that existed millions of years ago is likely to be achieved within a few hundred years. 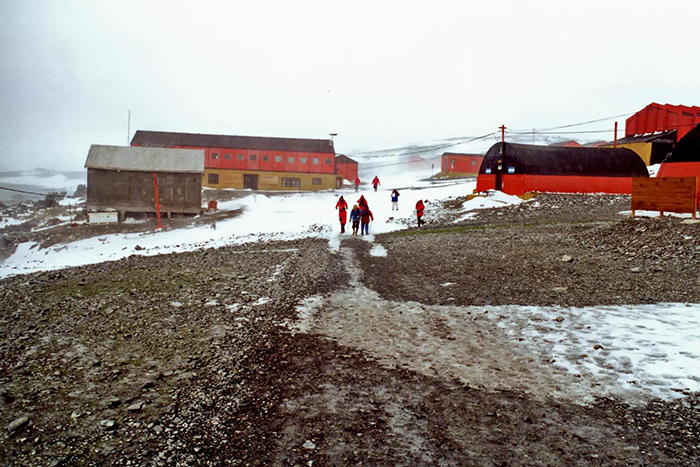 The larger town out of two that exist in Antarctica, is Villa Las Estrellas (The Stars Town), founded in 1984 by Pinochet, who wanted to reaffirm Chile’s presence in the region. Today, this town is a research station and has a school, hospital, hostel, post office, internet and even TV and mobile phone coverage. 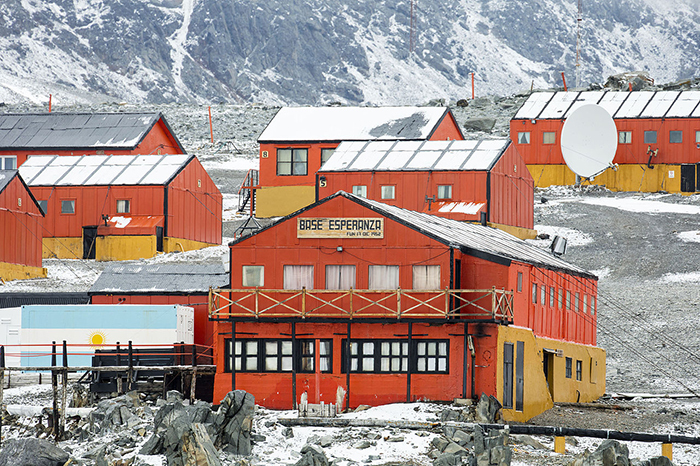 The other town is called Esperanza Base and serves as an Argentine research station. 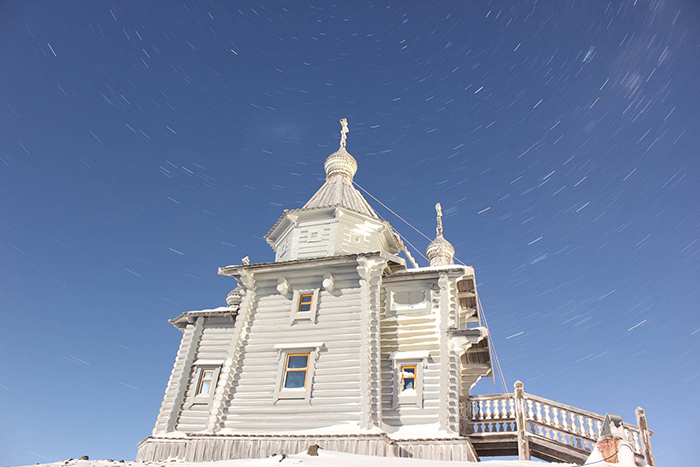 It houses 55 inhabitants in winter, including 10 families and 2 school teachers. The town was established in 1953. It became widely-known in 1978 due to the birth of Emilio Marcos Palma, the first person to be born in Antarctica. 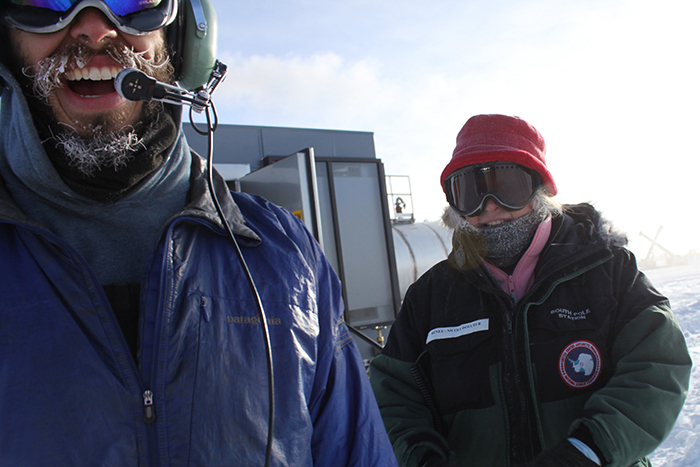 Back in 2013 it was thought that the coldest surface temperature on Earth, recorded in Antarctica, was -135°F (-93°C). However this year the study has been revised and scientists announced that on the coldest site on Earth, temperatures can drop even lower, to -144 °F (-98 °C). They were observed during polar night, in wintertime. 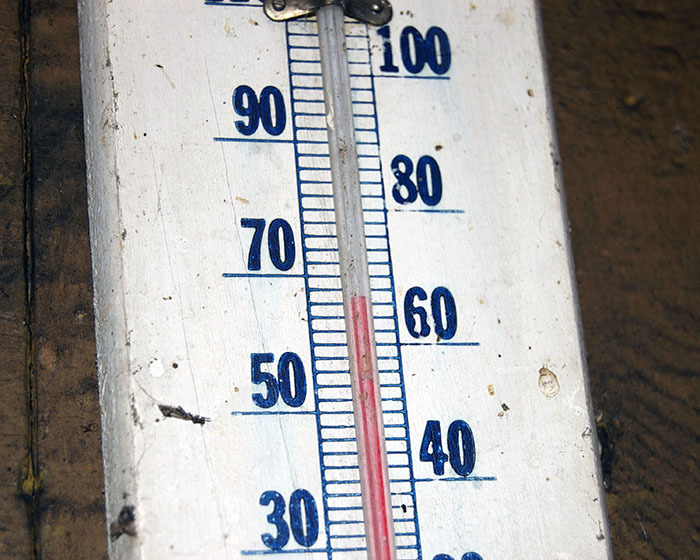 This record of -144 °F (-98 °C ) is about as cold as it is possible to get at Earth’s surface, according to the scientists. The conditions under which such low temperature can occur, are dry air and a clear sky, persisting for several days. If they persisted longer, the temperature could drop even lower, but researchers don’t think that it is likely to happen. 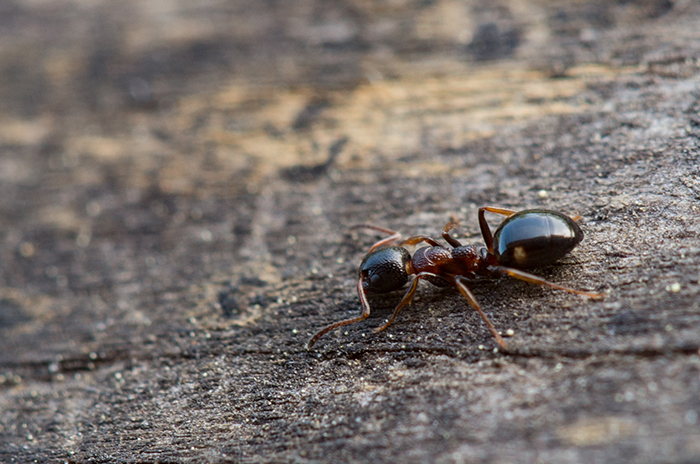 Just about every piece of land on Earth harbors at least one native or invasive ant species. However, Antarctica, the Arctic and a handful of remote or inhospitable islands are the only places on Earth which are not colonized by ants. Antarctica is one of the windiest places on Earth and is home to unusual katabatic and downslope winds. The strong winds are influenced by cold temperatures and the shape of the continent. 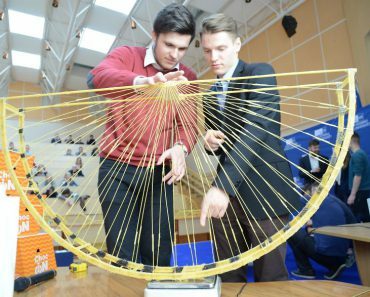 The highest recorded wind speed was at a French base back in 1972 – it was blowing at 200 miles per hour (320 km/h). And even though it doesn’t snow there that often, (contrary to what most of us would think), due to strong winds, the snow is picked up from the ground and moved around, which might look like it’s snowing. Back in 1911, sled dogs hauled supplies for Norwegian explorers led by Roald Amundsen. It was the first expedition to reach the South Pole. 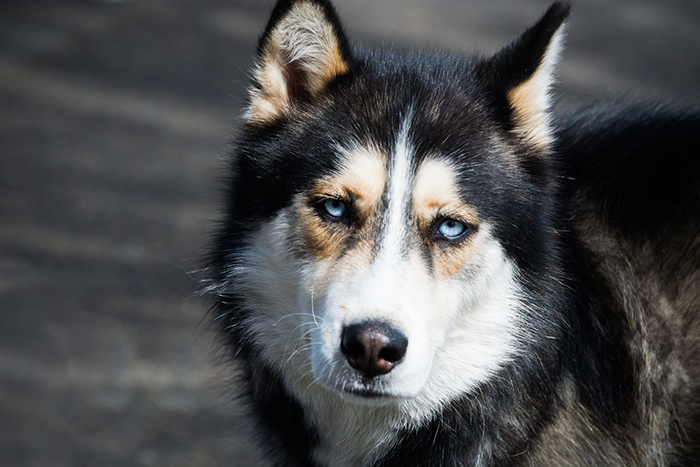 Afterwards, sled dogs were kept and used in Antarctica for years. However, they were banned from the continent in 1993 due to fear that they might transmit canine distemper to the Antarctic seals or would escape and disturb the local wildlife. 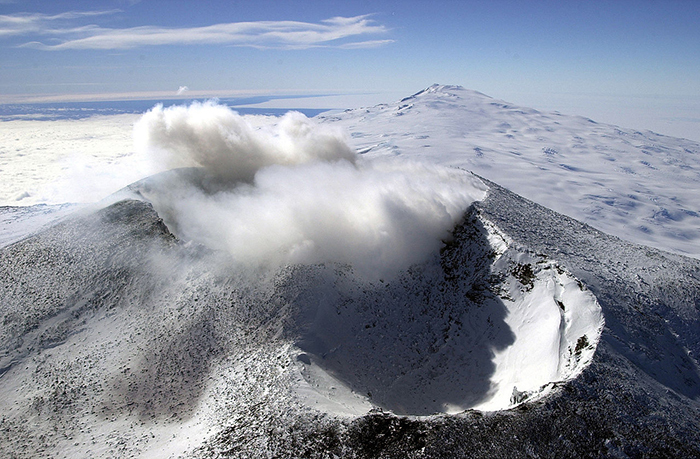 Mount Erebus is one of the few consistently active volcanoes and the southernmost active volcano on Earth. It contains a 1,700 °F (about 927 °C) lava lake, that is thought to be miles deep. Mount Erebus is always alive and bubbling, releasing gas and spitting out chunks of molten rock and feldspar crystals, rich in potassium, sodium and aluminum silicate. However, there is an abundance of other forms of wildlife, such as whales, seals, penguins and other birds. Penguins are the most common birds in the Antarctic. They live in colonies and survive in the harshest conditions. 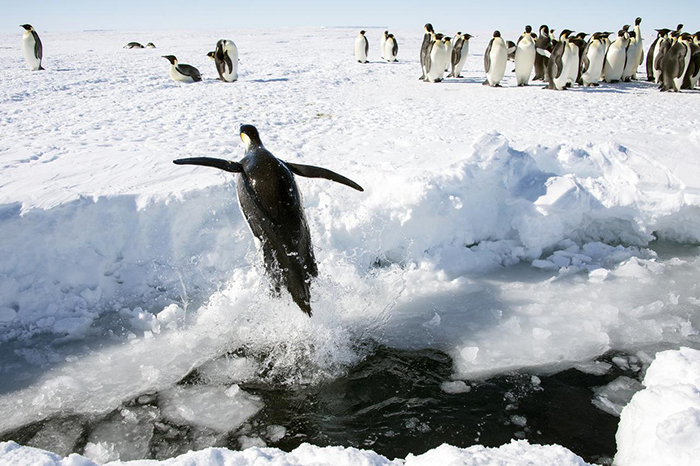 Out of the seventeen existing different species of penguins, two of them are permanent residents on Antarctica – the emperor and Adélie penguins. Others, like the macaroni, gentoo and chinstrap, breed on the northern tip of the Antarctic Peninsula, where the conditions are not that harsh. King penguins only breed on the warmer northern islands. Today the effects of climate change are so grave, that gravity itself is changing. According to the European Space Agency (ESA), in only three years, Antarctica has lost so much ice that it caused a shift in the Earth’s gravitational pull. As it was found during one study, the loss of ice from West Antarctica between 2009 and 2012 has actually caused a dip in the gravity field over the region. The surface area of the Antarctica is around 5,400,000 sq mi (14,000,000 sq km). In the winter, Antarctica doubles in size because of the ice building up around the coast of it. The continent is twice the size of Australia, 1.5 times the size of the United States and 50 times the size of United Kingdom. 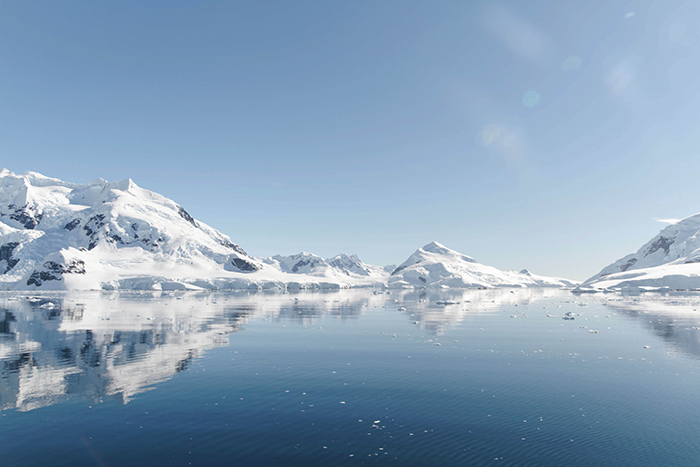 As of today, more than 300 large bodies of water have been identified under the continent of Antarctica. They do not freeze because of geothermal heat and pressure or simply put – the warmth of Earth’s core. 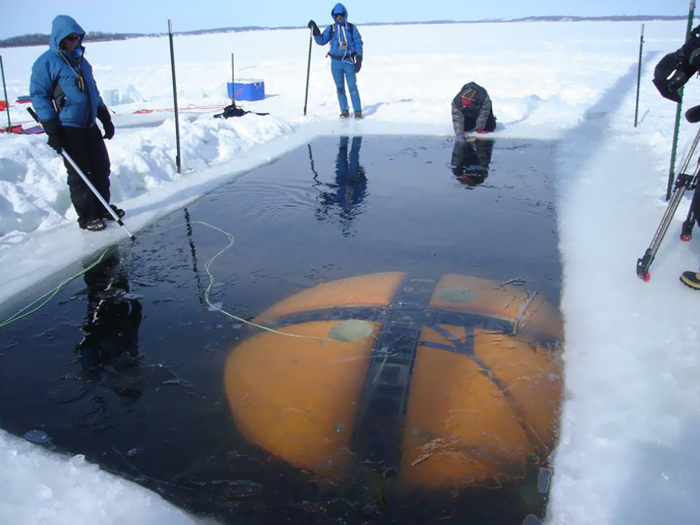 The lakes are a part of vast hydro-logical network under the thick ice sheet. It is known that some of the lakes are interconnected and exchange water. But some are thought to be completely isolated, which means that the water had to be in one place for thousands of years. Scientists believe that these isolated lakes might be home to microorganisms that are yet to be discovered by the modern science. The Brown bear of North America and Eurasia is the ancestor of the Polar bear. Naturally, Polar bears now live in countries that surround the Arctic Circle: US (Alaska), Norway, Russia, Canada and Greenland. 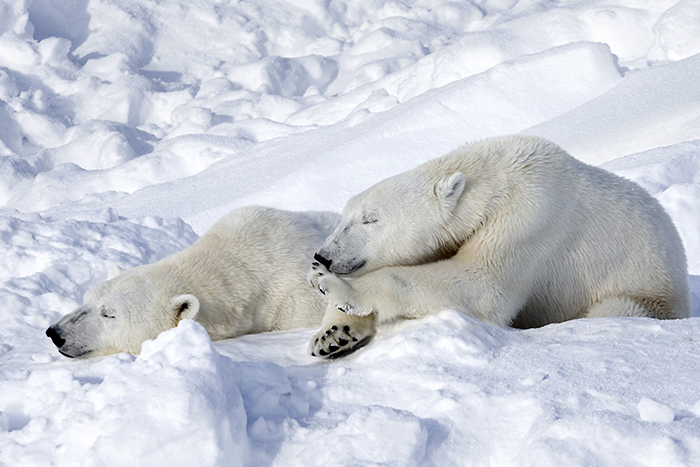 Contrary to the popular belief, Polar bears do not live in Antarctica, but only in the Arctic, as there was no way they could reach the south pole. Bears could not handle the tropical temperatures on the way down there, and there is no mean of getting there by land anyway. As Antarctica is mostly uninhabited, the continent is not officially divided into time zones. 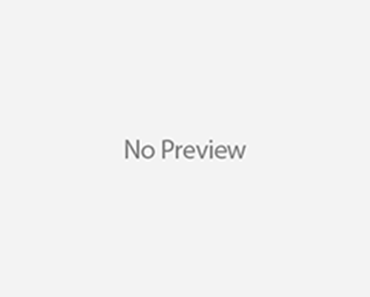 However, a number of existing research stations use either the time zone of the country that operates or supplies them, or use the local time of countries located nearby. 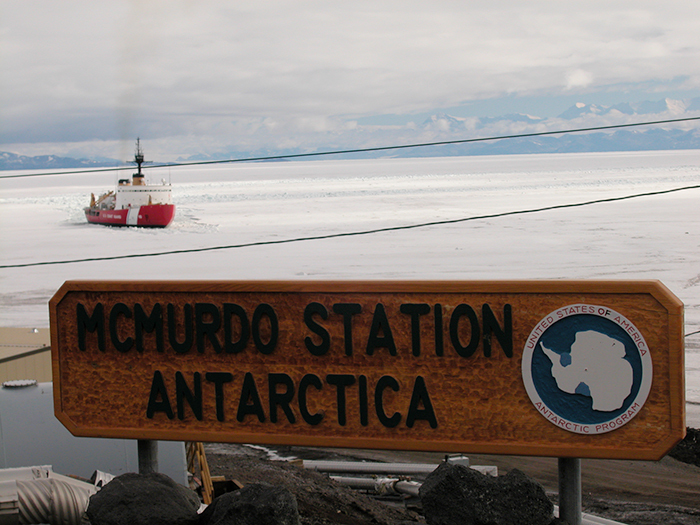 For example, McMurdo Station observes New Zealand Standard Time (NZST) during standard time and New Zealand Daylight Time (NZDT) during the Daylight Saving Time (DST) period in New Zealand. Palmer Station (an American research station) keeps Chile Summer Time (CLST) as Chile is the closest country to their station. 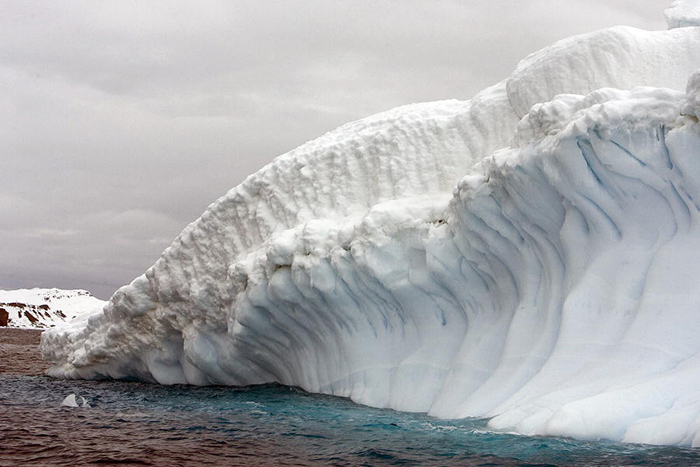 In the past 25 years Antarctica has lost more than 3 trillion tons of ice. Sadly, the ice loss process has accelerated dramatically over the last five years. While analyzing data from multiple satellite surveys from 1992 to 2017, a group of 84 international researchers has found that Antarctica is currently losing ice about three times faster than it did before 2012. Now it is predicted that more than 241 billion tons of ice are lost each year. Despite all its ice, Antarctica is technically a desert, because of the low precipitation levels. The inner regions receive an average of 2 inches (50 millimeters) precipitation (in the form of snow) each year. To compare, the Sahara desert receives twice as much rain each year. 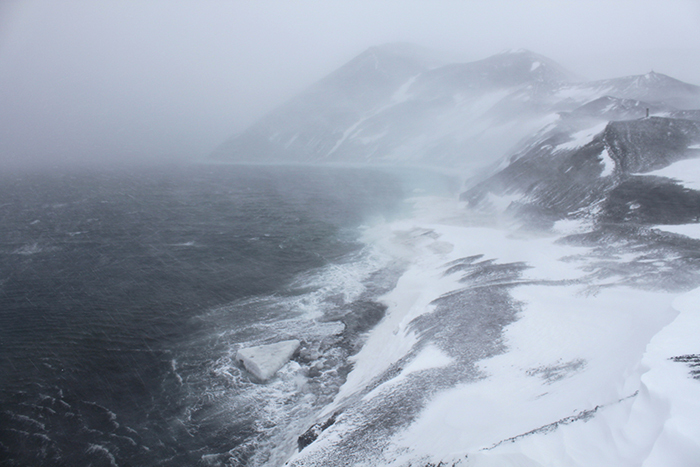 The coasts of Antarctica receive more falling moisture, but unlike in other deserts, it doesn’t soak into the ground. 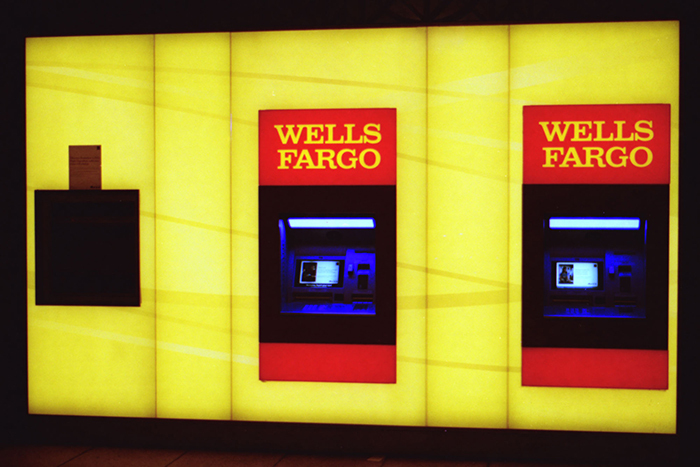 The banking conglomerate Wells Fargo installed an ATM back in 1998 at McMurdo Station, the largest science hub on the continent. While it is near New Zealand territory, the ATM only dispenses US dollars. Even in one of the harshest climates in the world, people still find time to build places of worship, which are all Christian. Today, there are at least seven Christian churches on the icy continent – Chapel of the Snows, Trinity Chapel, The Ice Cave Catholic Chapel, San Francisco de Asis Chapel, St. Ivan Rilski Chapel, Chilian Chapel of Santa Maria Reina de la Paz and the Catholic Chapel of Santisima Virgen de Lujan.